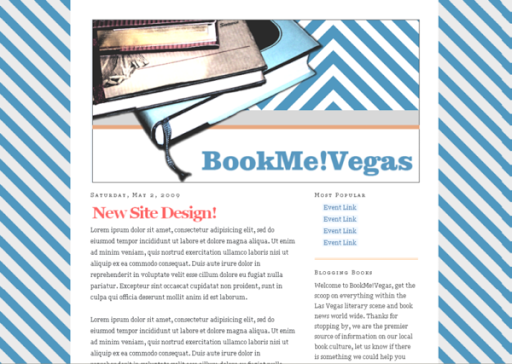 New site design I just completed for BookMe!Vegas that will be online soon. That's all for now. Meh. I wish I would build a nice site for myself. He he. It looks exactly like this blog? same template? Yeah, tried to pass this off as something more spectacular, but you got me, he he. Just a blog template I designed, simple two column. He he, and I gave it my signature blog post title font style (georgia bold 30px letter spacing -2px) because I just love it, so it looks even more similar to my own... He he. I can't help but laugh now when I look at this post. Blogger is a shiney new toy to me still. I was quite pleased with myself. He he.